Gregory Rudolph Harts was born April 21, 1950 at Atlanta, Georgia. The six foot tall, speedy left handed Harts, was signed by the New York Mets as an amateur free agent in 1970. In 1972 Harts stole 22 bases with 23 doubles 4 HRs & 18 RBIs while batting .286 at A ball Visalia. He closed out the season at AA Memphis & returned there in 1973. That year he hit .263 stealing just eight bases but hit 23 doubles in 133 games played. He got a September call up, during the heat of the Mets tight pennant race. He made his MLB debut as a pinch hitter on September 15, 1973 in the second game of a double header, during a 7-0 loss to the Chicago Cubs. He got the honor of getting a hit in his first career at bat, a fifth inning single off Rick Reuschel. However, he only had one other at bat that week, and the appeared as a pinch runner in his last game on September 20, 1973. 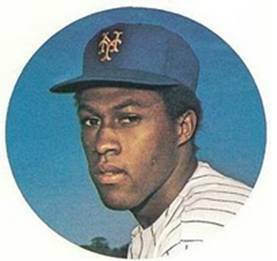 Primarily an outfielder, he never played the field with Mets, and after not cracking an outfield position in 1974, actually tried to become a pitcher, but that didn’t work out either. 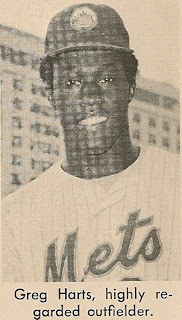 He played in the Mets system through 1975 making it as far as AAA Tidewater for 35 games that season, but only hit .184. He retired from the game & moved on becoming another early seventies yearbook prospect that never quite made it. At the plate he went 1-1 lifetime good for a .500 average.